End of Season Report Tomas Rosicky (Little Mozart) | "It's all about the Arsenal"
Arsenal signed a 25-year-old Rosický in May 2006 taking the shirt from Arsenal legend/genius and now departed Robert Pires He made his debut against Dinamo Zagreb in the Champions League. He scored his first goal against Hamburg the Champions League. In January and then scored a brace against Liverpool in the FA Cup and his first Premiership goal against Wigan. He also scored against Bolton and Man City, in all he scored 6 goals in 37 appearances in all competitions in his debut season at Arsenal. Tomas did not feature for Arsenal during the 2008–09 season due to his hamstring tendon injury. He eventually returned to full training in May 2009, after eighteen months of absence. He scored a 93rd minute equalizer in a 2–2 draw against Everton to grab a crucial point. His third goal of the season came against Bolton in a 4–2 victory after Arsenal had gone down 2–0 Rosicky began the comeback by scoring the first Arsenal goal right before half time. By the end of the season, he made 34 appearances in total, scoring one goal in all competitions as Arsenal finished fourth in the Premier League. TR7 started against both Newcastle and Manchester United, and played a superb game as a second-half substitute in the Champions League qualifier second leg against Udinese. He featured twice in Sept, coming on as a late sub in the 3-0 victory over Bolton before starting in the against Olympiacos at the end of the month. He then started in the team’s victories over Sunderland and Marseille in Oct, before coming on as a late sub in a superb 5-3 victory over Chelsea. 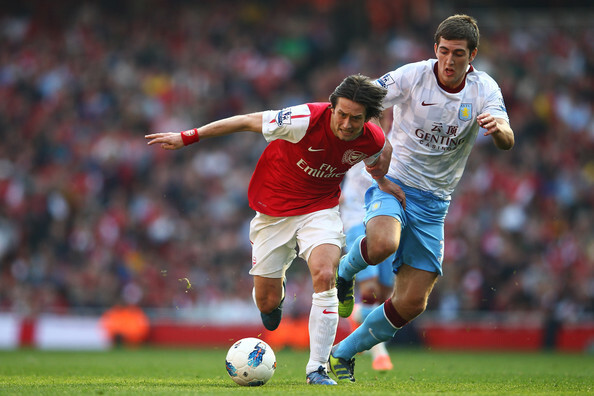 TR7 made just two appearances in Jan, both as sub against Marseille and West Brom. in Nov and one in Dec against Wolves though he was a regular form the subs bench. Tomas had two starts, in fourth-round FA Cup victory over Aston Villa and the defeat to Man Utd and also made sub appearances against Fulham and Swansea. He enjoyed a good run in the side during Feb, impressing in wins over Blackburn and Sunderland, before grabbing a goal in a man-of-the-match display against Spuds in the 5-2 thrashing of the mob down the road. He built on an award-winning March another good month of from month in midfield, starting in all but one match. His highlight of the month was a superb assist for RVP’s goal against Stoke in another man-of-the-match display. TR7 continued to play well in heart of midfield and started both of the team’s final two matches against Norwich and WBA (my Sons first away match outside London). I think he can rightly take plaudits for his form from Feb onwards and having a lot to do with Arsenal resurgence in form. He battles way brilliantly in midfield, always looks to go forward, which Arsenal were missing. He has a great eye for a pass, can shoot well (just needs get it in the net more often) and just never stops running. I like the fact that he is one of the players we have that has the eye for a pass and can open up any defence. TR7 is another my favorite Arsenal players and could not be more pleased for he new lease of life after some bad runs of injuries. The good thing about Tomas was not only did he bring an urgency to our play and he also have plenty of experience and used that to drive the side forward. Please feel free to comment either here or on Twitter.